Mr Green casino is celebrating their 10th year anniversary and is offering its members a chance to win exclusive tickets to watch the football World Cup in Russia. 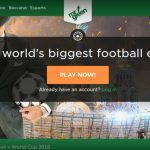 As the Mr Green World Cup 2018 promotion grand prize, the online casino is giving away three Russia World Cup 2018 packages for two people each. The sporting event takes place from June 14, 2018 to July 15, 2018. 32 participating nations will play a total of 64 games until a world champion is established. The top favorite for the World Cup 2018 title is the reigning world champion and FIFA Confederations Cup winner, Germany. Mr Green Casino will of course be present at the 2018 FIFA World Cup in Russia and wants to invite you to watch the best footballers in the world fight for one of sports’ most coveted trophy. Read on to learn how you can win a trip to Russia with the Mr Green World Cup 2018 campaign. Whether you’re a new member (do not forget the Mr Green welcome bonus) or an existing member at Mr Green casino, you have an equal opportunity to qualify for the exclusive trip to watch the spectacle live in St. Petersburg, Russia. To become one of the lucky winners, all you need to do is try your luck every week during the campaign period by playing at the selected slots. During the Mr Green World Cup 2018 Road to Russia campaign, which lasts until Sunday, April 22, it must be your goal to score a ‘hat-trick‘. Don’t worry, it’s not as hard as it sounds. You are simply required to earn a weekly goal. If you earn a weekly goal in three consecutive weeks, you will have made a hat-trick and now have a chance to win one of the 2018 World Cup packages in the final draw. To earn your weekly goal, you have 2 options. You can either play at least 500 real money spins on selected video slot machines OR participate in sports betting. If you choose sports betting, you must wager at least £100 per week with odds >1.60. Players who have fulfilled the requirements for the ‘goal’ either through spins or sports betting can claim their ‘goal’ at the end of the week. After 3 weeks, the grand prize winners will be announced LIVE on the exclusive Mr. Green Blackjack Table 3 on April 23. 1st Prize: You fly with a companion from June 15 to June 20 for 5 days to St. Petersburg. There you will watch the host country Russia vs Egypt and Morocco vs Iran, live in the stadium. You also have the opportunity to watch the group matches France vs Australia, Germany vs Mexico and Sweden vs South Korea in an exclusive viewing. In addition to the sporting events, you will also explore the charming city of St. Petersburg on a city tour and get to know the culinary specialties on a “Wining & Dining” tour. 2nd Prize: You get to watch Brazil vs Costa Rica and spend 3 days in an exclusive hotel in Saint Petersburg from June 21st to June 24th. You also have the option to watch an exclusive viewing of Germany vs Sweden. In addition, Mr Green invites you to a special city tour and a top class “Wining & Dining” tour. 3rd Prize: From June 25th to June 28th, you will not only get to tour St. Petersburg city, but also watch the group match Nigeria vs Argentina live in the stadium. In addition, you and your companion can also enjoy watching Switzerland vs Costa Rica in an exclusive viewing. One evening will be spent on an elegant Wining & Dining experience. All three trips are hosted by a representative from Mr Green Club Royal. It would not be Mr Green if there were only these three prizes. If you are not lucky enough to win the grand prize, do not lose hope, Mr Green casino is offering additional prizes. All participants who play at least 100 real money spins on the slots automatically receive 20 Free Spins on selected slots. Up to 300 bonus free spins can be won per week. In addition, players who played their weekly goal on sports bets will get a bonus of £5 for every £100 wagered. This bonus is limited to a maximum of £25 per week. The Road to Russia campaign runs exclusively on Mr Green from 2 to 22 April 2018. Each player gets the chance to participate in weekly spins to win free spins or the main prize in the form of the World Cup 2018 Russia Package. The trips to Russia take place from 15 to 20 June, 21 to 24 June and 25 to 28 June 2018. The respective prize weeks will run from 2 to 8 April, 9 to 15 April and 16 to 22 April 2018. Each player may unlock a maximum of three prize draw tickets, which will automatically qualify him/her for the draw at the end of the campaign.